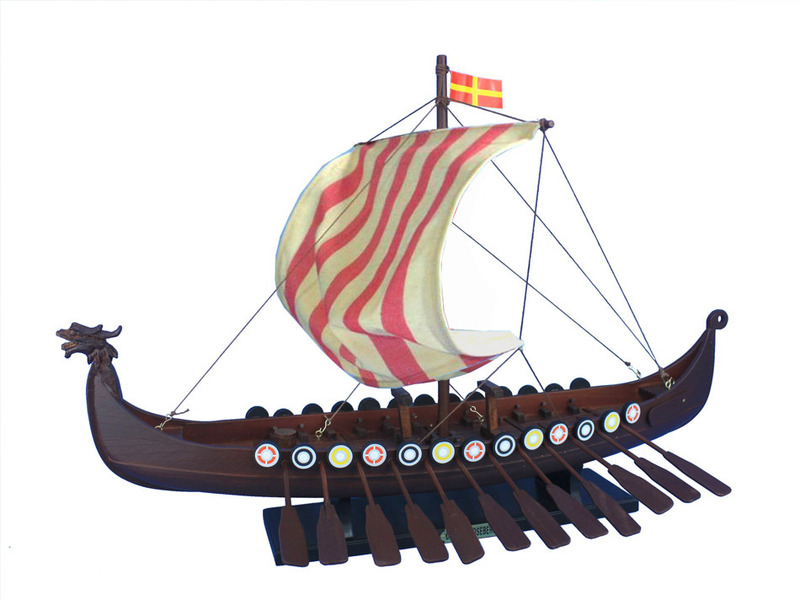 Share the courageous spirit of adventure that made the vikings the greatest explorers, traders and feared raiders of their age with this replica Drakkar Viking longship model. The "Viking" was built at Framnes Shipyard in Sandefjord, Norway in 1892. It was copied after the ancient Viking ship "Gokstad". Excavated in 1880, the "Gokstad" had been called the most beautiful ship ever built. The "Viking" is approximately 78 feet long, 17 feet wide, and 7 feet high from the bottom of the keel to the gunwale. Clinker built with planking hand split from green logs, the "Viking" made 11 knots and the hull was observed to flex with the waves. The "Viking" became one of the greatest attractions at the World's Columbian Exposition. Since the close of the Exposition the "Viking" was held first by the Federation of Norwegian Women's Societies and later by the Chicago Park District. The ship was first housed beside the Field Columbian Museum in Chicago, then restored in 1920 and placed in Lincoln Park under a fenced-in, wooden shelter. Although legal trustee of the Viking ship, the Chicago Park District set aside no funds for maintenance of the boat or its wooden shelter. For many decades the Norwegian-American community provided regular maintenance to the ship by cleaning it annually. But as the years passed, the wooden shelter, began to fail, and the "Viking" began to suffer from weather damage. In 1978 the Scandinavian-American community rallied by forming an organization, The Viking Ship Restoration Committee, whose goal was to restore the Viking and find suitable permanent housing. The Committee consisted of several Scandinavian organizations that were able to raise funds through donations. This Committee set to work raising money and researching sites. The committee invested a portion of its money into obtaining blueprints and architectural plans for several possible locations. At different times the committee was close to placing the "Viking" in its own museum, at one time on Chicago 's museum campus, and at another time on Navy Pier. All these attempts failed for various reasons. In 1993 the Chicago Park District made it known that the Viking ship would have to be moved from its location to make room for expansion of the Lincoln Park Zoo. In a letter dated 9/7/93 addressed to the registered agent of the Viking Ship Restoration Committee, from the General Superintendent of the Chicago Park District, the Chicago Park District requested that the ship be cleaned, tarped and moved from Lincoln Park to proper storage. Again the Scandinavian-American community rallied. The American Scandinavian Council offered to commit funds to clean, move and store the "Viking". 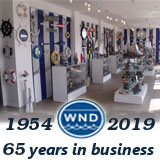 In 1994 the Chicago Park District "sold" the ship to the American Scandinavian Council which assumed the obligation to display, repair and perpetually care for the ship. The Council secured a location at a warehouse in West Chicago. They paid to have the "Viking" transported some 40+ miles to this location. Afterwards it was moved to Good Templar Park in Geneva, Illinois and secured under a canopy. This canopy has been replaced several times by a generous donor (most recently in the winter of 2006). The dragon "head" and "tail" of the Viking ship remain in storage at the Museum of Science and Industry. In 2000 the Scandinavian-American Council ceased to exist before accomplishing the obligations. As a result ownership reverted to the Chicago Park District. A ship this beautiful, which we also believe is the largest remaining artifact of the World's Columbian Exposition in Illinois, deserves to be preserved. The "Viking" should be valued for the fine ship she is and placed into a museum for the public to admire. On February 28, 2007 the "Viking" was declared one of ten most endangered historic sites in Illinois by "Landmarks Illinois", a statewide historic preservation advocacy group.